Now that you've created some leads and populated your Existing Lead Contacts List, you may need to edit some of the information associated with those leads. Perhaps you've gotten more information from the potential customer, or you need to change the contact associated with it. The Edit Lead screen allows you to edit the details of existing leads, as well as associate them with other entities within Method. Let's go through the steps required to edit a lead! 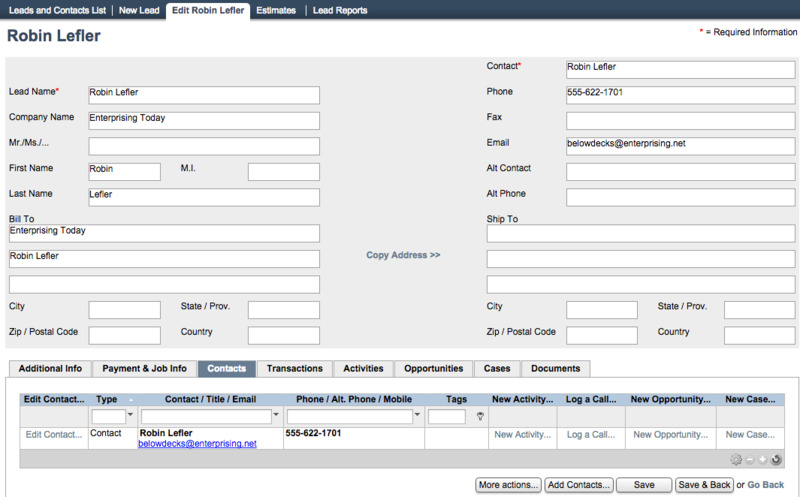 In Method CRM, click Leads > Leads and contacts list. Choose the lead you'd like to edit and click Go to next to the chosen entry. This will open the edit screen as well as a temporary Tab link in your tab link bar. You can navigate away from this tab link and navigate back without losing data you've typed into fields. Ensure both the Lead name and Contact fields are filled out – they do not have to have the same information (you can change both of these fields to suit your needs) but they must be filled out in order for Method to save the lead. The bottom of the screen features a series of clickable tab sections that each open their own unique set of options. You can choose to edit the information listed in additional info update the payment information view all the lead's transactions and create or edit activities, estimates, invoices and documents associated with this lead. Click save at the bottom of the screen. This will save whatever changes you've made to the fields in this lead and will update any changes that appear in the viewable portion of the leads and contacts list. The following is a breakdown of the Edit Lead screen. We'll take a closer look at each element of the screen (dropdown lists, buttons, etc.) so you know exactly what each element does. We hope this will be a useful roadmap for new users! Clicking go to... next to a lead on the Existing Lead Contacts List will open the Edit Lead screen, which will be automatically populated with the information from the original lead. Alt contact: This field allows you to provide an alternate contact name for this lead. This is the person you can speak to in case your primary contact is unavailable. Neither of these fields is required, so only include this information if you feel it's pertinent. At the bottom of the screen you will see some of the familiar buttons you've seen elsewhere in Method. More actions: This button will allow you either to Delete lead, which cannot be undone, or bring up the Notes screen. Here you can write notes regarding any additional pertinent information pertaining to this lead, and then either Save it and continue writing, or Save & Close which will return you to the Edit lead screen. Convert to customer: This button will convert this lead permanently into a customer, which means it will no longer appear in the Existing Lead Contacts List, nor will it be labeled a Lead within Method. It will appear from now on in the Customers and contacts list and will henceforth be considered a customer record (which means it will sync to your QuickBooks). When you click this you will be prompted with an "are you sure" message. Be sure, because once the lead becomes a customer, it can't be undone! Save & Back: saves the information on the screen and then returns to you the Existing Lead Contacts List. Go back: returns you to the Existing Lead Contacts List without saving the information on the screen. The Job of customer, Type and Terms fields are all to do with QuickBooks. Even though Leads don't sync to QuickBooks, these fields are in place to provide additional information ahead of these leads becoming customers. The same is true of the payment and pricing information you can include: until the lead becomes a customer, this information won't be needed. Sales rep: This dropdown list allows you to choose a sales representative from your Method users to associate with this lead. You can also create a new sales representative, which you can learn how to do in the New Sales Rep documentation. Lead is active? : This checkbox must be checked in order for the lead to appear in the Active filter view on the Existing Lead Contacts List. Tax code: This dropdown list lets you determine whether a sale associated with this lead is taxable or not. Tax item: This dropdown list lets you determine whether a sale associated with this lead will be taxed in or out-of-state. Refer to your local state laws for specific information as to whether or not sales are taxable. As on the New Lead screen, this area gives you the opportunity to fill in pertinent details of the lead's payment information. End date: Opens a clickable calendar for you to choose a firm end date for this job, if one has been agreed upon between you and the lead. This opens a grid detailing all the contacts you have associated with this lead. For more information on how to navigate grids in Method, see our article on Grid functionality. There is also a button marked "Add Contacts", which will open the Add/Edit Contacts (for this lead) screen. Please see the Contacts documentation for more information on this screen. This opens a grid detailing all the transactions associated with this lead. For more information on how to navigate grids in Method, see our article on Grid functionality. There is also a button marked "New Transaction", which gives you the option of opening one of several new screens, including credit memo, estimate, invoice, receive payment, sales order and sales receipt. When saved, these transactions will be associated with this lead and appear in this grid. Leads can only have transactions associated with them if wait for sync approval is checked (please see the transaction documentation linked above for more information). Once a transaction is synced with QuickBooks, the lead is automatically converted to a customer. This opens a grid detailing all the activities associated with this lead. For more information on how to navigate grids in Method, see our article on Grid functionality. This opens a grid detailing all the opportunities associated with this lead. For more information on how to navigate grids in Method, see our article on Grid functionality. This tab lists all the cases associated with this lead. For more information on how to navigate grids in Method, see our article on Grid functionality. This tab lists all the documents associated with this lead. For more information on how to navigate grids in Method, see our article on Grid functionality.